Sulfuricurvum kujiense Kodama and Watanabe 2004 is the type species of the monotypic genus Sulfuricurvum, which belongs to the family Helicobacteraceae in the class Epsilonproteobacteria. The species is of interest because it is frequently found in crude oil and oil sands where it utilizes various reduced sulfur compounds such as elemental sulfur, sulfide and thiosulfate as electron donors. Members of the species do not utilize sugars, organic acids or hydrocarbons as carbon and energy sources. This genome sequence represents the type strain of the only species in the genus Sulfuricurvum. The genome, which consists of a circular chromosome of 2,574,824 bp length and four plasmids of 118,585 bp, 71,513 bp, 51,014 bp, and 3,421 bp length, respectively, harboring a total of 2,879 protein-coding and 61 RNA genes and is a part of the Genomic Encyclopedia of Bacteria and Archaea project. Strain YK-1T (= DSM 16994 = ATCC BAA-921 = JCM 11577) is the type strain of the species Sulfuricurvum kujiense, which is the type species of the monotypic genus Sulfuricurvum [1,2]. The genus name was derived from the Latin words ‘sulfur’ and ‘curvus’ meaning ‘curved’, yielding the Neo-Latin word ‘Sulfuricurvum’, the ‘curved bacterium that utilizes sulfur’ . 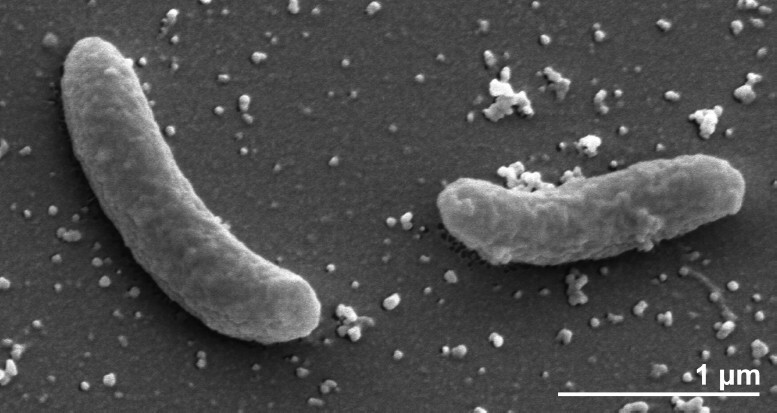 The species epithet is derived from the Neo-Latin word ‘kujiense’ (referring to Kuji, Iwate Prefecture, Japan, where the bacterium was isolated) . Three more strains of the species S. kujiense were isolated from the same habitat and exhibited identical physiological characteristics with the type strain YK-1T . Sulfuricurvum spp. have been detected in different groundwater environments [4,5] and in oil fields . Here we present a summary classification and a set of features for S. kujiense strain YK-1T, together with the description of the complete genomic sequencing and annotation. The highest-scoring environmental sequence was AB030609 (‘groundwater clone 1061’) , which showed an identity of 99.7% and an HSP coverage of 96.9%. The most frequently occurring keywords within the labels of all environmental samples which yielded hits were ‘spring’ (9.6%), ‘cave’ (9.4%), ‘microbi’ (6.9%), ‘sulfid’ (5.7%) and ‘mat’ (5.2%) (247 hits in total). These keywords suggest that habitats for S. kujiense well-matched to that supposed in the original description  and other publications [3,12]. Environmental samples which yielded hits of a higher score than the highest scoring species were not found. Figure 1 shows the phylogenetic neighborhood of S. kujiense YK-1T in a 16S rRNA based tree. The sequences of the three 16S rRNA gene copies in the genome differ from each other by one nucleotide, and differ by up to two nucleotides from the previously published 16S rRNA sequence (AB053951). 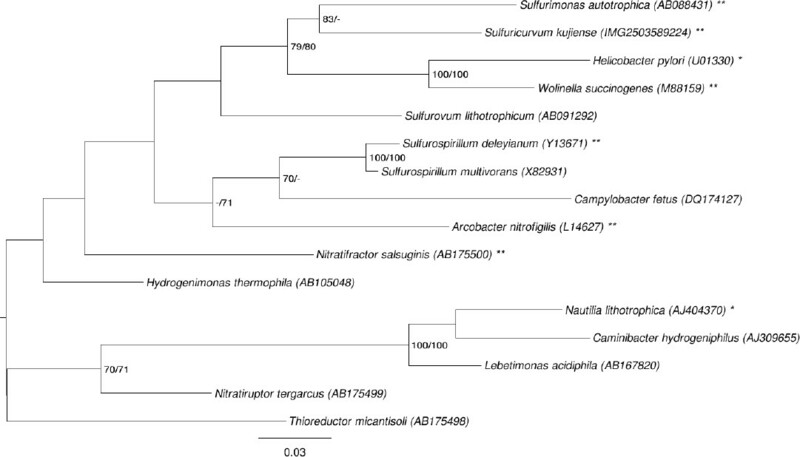 Phylogenetic tree highlighting the position of S. kujiense relative to the type strains of the type species of the other genera within the class Epsilonproteobacteria. 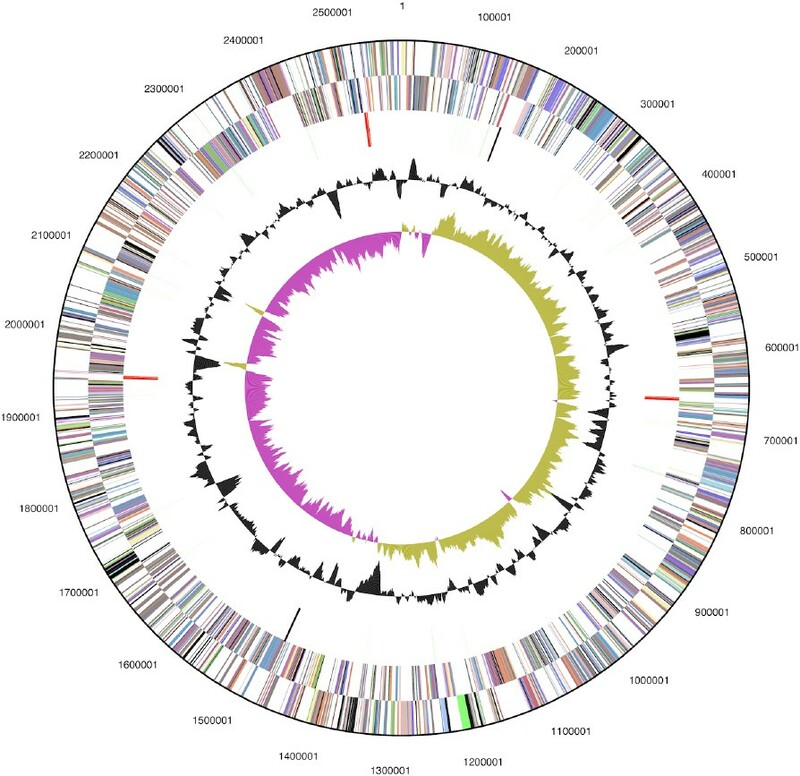 The tree was inferred from 1,364 aligned characters [13,14] of the 16S rRNA gene sequence under the maximum likelihood (ML) criterion . Rooting was done initially using the midpoint method  and then checked for its agreement with the current classification (Table 1). The branches are scaled in terms of the expected number of substitutions per site. Numbers adjacent to the branches are support values from 1,000 ML bootstrap replicates  (left) and from 1,000 Maximum-Parsimony bootstrap replicates  (right) if larger than 60%. Lineages with type strain genome sequencing projects registered in GOLD  are labeled with one asterisk, those also listed as ‘Complete and Published’ with two asterisks [20–24]. As one of the families selected for Figure 1, Nautiliaceae (comprising the genera Caminibacter, Lebetimonas, Nautilia, Nitratifractor, Nitratiruptor and Thioreductor) did not appear as monophyletic in the tree, we conducted both unconstrained heuristic searches for the best tree under the maximum likelihood (ML)  and maximum parsimony (MP) criteria  as well as searches constrained for the monophyly of all families (for details of the data matrix see the figure caption). Our own re-implementation of CopyCat  in conjunction with AxPcoords and AxParafit  was used to determine those leaves (species) whose placement significantly deviated between the constrained and the unconstrained tree. The best-known ML tree had a log likelihood of −8,012.83, whereas the best trees found under the constraint had a log likelihood of −8,014.70. The significantly (α = 0.05) distinctly placed species were Hydrogenimonas thermophila (‘Hydrogenimonaceae’), Nitratifractor salsuginis and Thioreductor micantisoli (Nautiliaceae). However, the constrained tree was not significantly worse than the globally best one in the Shimodaira-Hasegawa test as implemented in RAxML  (α = 0.05). The best-known MP trees had a score of 1,290, whereas the best constrained trees found had a score of 1,295 and were not significantly worse in the Kishino-Hasegawa test as implemented in PAUP*  (α = 0.05). (See, e.g. chapter 21 in  for an in-depth description of such paired-site tests.) Accordingly, the current classification of Campylobacterales (Campylobacteraceae, Helicobacteraceae, ‘Hydrogenimonaceae’) and Nautiliales (Nautiliaceae) is not in significant disagreement with the 16S rRNA data. The cells of strain YK-1T are curved rods of 0.4 × 1–2 µm length (Figure 2) . Spiral cells are also observed in the exponential growth phase . S. kujiense cells stain Gram-negative and non spore-forming (Table 1). The organism is described as motile with one polar flagellum (not visible in Figure 2). Motility-related genes account for 5.3% of total genes in the genome (COG category N). The organism is a facultatively anaerobic chemolithoautotroph [1,3]. S. kujiense can grow only under NaCl concentrations below 1% [1,3]. A low-ion-strength medium (MBM) has been developed for growing S. kujiense [1,3]. The organism also grows in solid medium containing 1.5% Bacto-agar [1,3]. The temperature range for growth is between 10°C and 35°C, with an optimum at 25°C [1,3]. The pH range for growth is 6.0–8.0, with an optimum at pH 7.0 [1,3]. S. kujiense grows autotrophically on carbon dioxide and bicarbonate [1,3]. The organism does not utilize organic acids such as acetate, lactate, pyruvate, malate, succinate, or formate nor does it utilize methanol, glucose or glutamate [1,3]. S. kujiense is not able to ferment phenol, octane, toluene, benzene, benzoate or ascorbate [1,3]. S. kujiense uses sulfide, elemental sulfur, thiosulfate and hydrogen as electron donors, and nitrate as well as small amounts of molecular oxygen (1% in gas phase) as electron acceptors [1,3]. It does not utilize nitrite [1,3]. S. kujiense shows oxidase activity, but is catalase-negative [1,3]. The organism is of ecological interest because of its ability to utilize different sulfur species and nitrate [1,3]. Classification and general features of S. kujiense YK-1T according to the MIGS recommendations  and the NamesforLife database . S. kujiense strain YK-1T, DSM 16994, was grown anaerobically in DSMZ medium 1020 (MBM medium)  at 25°C. DNA was isolated from 0.5–1 g of cell paste using MasterPure Gram-positive DNA purification kit (Epicentre MGP04100) following the standard protocol as recommended by the manufacturer with modification st/DL for cell lysis as described in Wu et al. 2009 . DNA is available through the DNA Bank Network . The genome was sequenced using a combination of Illumina and 454 sequencing platforms. All general aspects of library construction and sequencing can be found at the JGI website . Pyrosequencing reads were assembled using the Newbler assembler (Roche). The initial Newbler assembly consisting of 18 contigs in two scaffolds was converted into a phrap  assembly by making fake reads from the consensus, to collect the read pairs in the 454 paired end library. Illumina GAii sequencing data (788.0 Mb) was assembled with Velvet  and the consensus sequences were shredded into 1.5 kb overlapped fake reads and assembled together with the 454 data. The 454 draft assembly was based on 124.3 Mb 454 draft data and all of the 454 paired end data. Newbler parameters are -consed -a 50 -l 350 -g -m -ml 20. The Phred/Phrap/Consed software package  was used for sequence assembly and quality assessment in the subsequent finishing process. After the shotgun stage, reads were assembled with parallel phrap (High Performance Software, LLC). Possible mis-assemblies were corrected with gapResolution , Dupfinisher , or sequencing cloned bridging PCR fragments with subcloning. Gaps between contigs were closed by editing in Consed, by PCR and by Bubble PCR primer walks (J.-F. Chang, unpublished). A total of 85 additional reactions were necessary to close gaps and to raise the quality of the finished sequence. Illumina reads were also used to correct potential base errors and increase consensus quality using a software Polisher developed at JGI . The error rate of the completed genome sequence is less than 1 in 100,000. Together, the combination of the Illumina and 454 sequencing platforms provided 408.5 × coverage of the genome. The final assembly contained 368,924 pyrosequence and 27,990,437 Illumina reads. The genome consists of a 2,574,824 bp long circular chromosome with a G+C content of 45% and four circular plasmids of 3,421 bp, 51,014 bp, 71,513 bp and 118,585 bp length, respectively (Table 3 and Figure 3). Of the 2,879 genes predicted, 2,818 were protein-coding genes, and 61 RNAs; 20 pseudogenes were also identified. The majority of the protein-coding genes (67.9%) were assigned with a putative function while the remaining ones were annotated as hypothetical proteins. The distribution of genes into COGs functional categories is presented in Table 4. Graphical map of the chromosome (plasmids not shown). From bottom to center: Genes on forward strand (color by COG categories), Genes on reverse strand (color by COG categories), RNA genes (tRNAs green, rRNAs red, other RNAs black), GC content, GC skew. We would like to gratefully acknowledge the help of Maren Schröder (DSMZ) for growing S. kujiense cultures. This work was performed under the auspices of the US Department of Energy Office of Science, Biological and Environmental Research Program, and by the University of California, Lawrence Berkeley National Laboratory under contract No. DE-AC02-05CH11231, Lawrence Livermore National Laboratory under Contract No. DE-AC52-07NA27344, and Los Alamos National Laboratory under contract No. DE-AC02-06NA25396, UT-Battelle and Oak Ridge National Laboratory under contract DE-AC05-00OR22725, as well as German Research Foundation (DFG) INST 599/1-2.